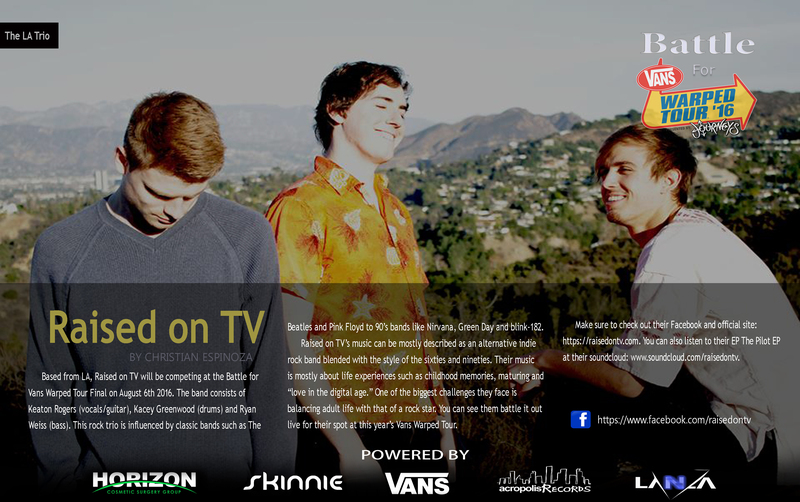 Based from LA, Raised on TV will be competing at the Battle for Vans Warped Tour Finale on August 6th 2016. The band consists of Keaton Rogers (vocals/guitar), Kacey Greenwood (drums) and Ryan Weiss (bass). This rock trio is influenced by classic bands such as The Beatles and Pink Floyd to 90’s bands like Nirvana, Green Day and Blink-182. Raised on TV’s music can be mostly described as an alternative indie rock band blended with the style of the sixties and nineties. Their music is mostly about life experiences such as childhood memories, maturing and “love in the digital age.” One of the biggest challenges they face is balancing adult life with that of a rock star. You can see them battle it out live for their spot at this year’s Vans Warped Tour. Make sure to check out their Facebook and official site: https://raisedontv.com. You can also listen to their EP The Pilot EP at their soundcloud: www.soundcloud.com/raisedontv.